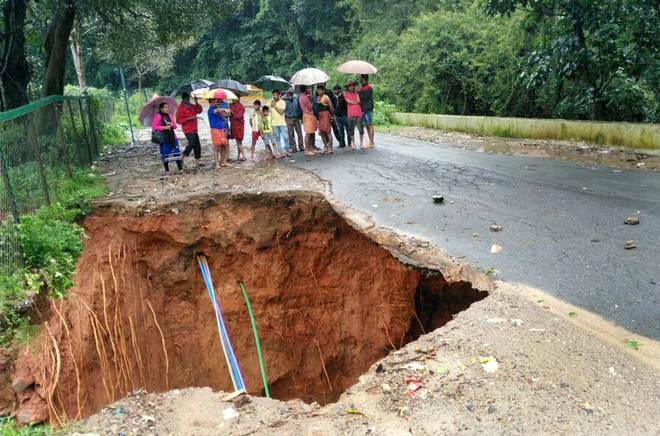 Vehicular traffic between Karnataka and Kerala through Kodagu was paralyzed after a portion of the highway caved in near Virajpet on Thursday in view of the heavy downpour battering Kodagu for the last few days. Following the landslip near the Perumbadi check-post, the highway has been closed for traffic and the Kodagu district administration has been trying to find an alternative route to Kerala. Though the rain had slackened on Thursday in most parts of Kodagu, Bhagamandala near Talacauvery, the birthplace of river Cauvery, continued to receive heavy showers. Bhagamandala has turned into an island as flood water has surrounded the holy town, and road link has been cut off. In view of the heavy rains in the past few days, the Kodagu district administration had ordered the closure of schools and colleges on Thursday. According to reports, Kodagu received 121.62 mm of rains during the last 24 hours. Though it has been raining heavily in Kodagu, rainfall recorded in the district from January this year is 994.16 mm as against 1,065.27 mm recorded during the corresponding period last year. The monsoon has been weak in Kodagu for the past few years, especially after over 50,000 trees were cut in the district for drawing high tension transmission lines to Kerala. The entire Kodagu district was declared as drought-affected last year. The specter of another drought was feared this year too as the rains had played truant after a few early showers this year. The revival of the monsoon has brought cheer to the people of Kodagu. VIRAJPET MLA CANDIDATE: WILL MACHIMADA RAVINDRA REPLACE K. G. BOPAIAH?